Through a pack-free hike, hikers will enjoy the convenience of only carrying a small day bag while hiking and accessing their other belongings at the luxury accommodation, that they will return to daily. The pack-free hike also has the option of a guided hike, the only guided hiking tour that Fraser Island Hiking offers. This way hikers are able to gain first hand experience and knowledge of the area and know they are fully safe and looked after by the guide. Beach house - a non-guided, fully supported walk with accommodation in our Fraser Island beach house (Bringabeeralonghouse). Note: Minimum 6 people per hike (if you have booked less than 6 people then you may be added to a group of other smaller groups). This hike runs ALL year round*! 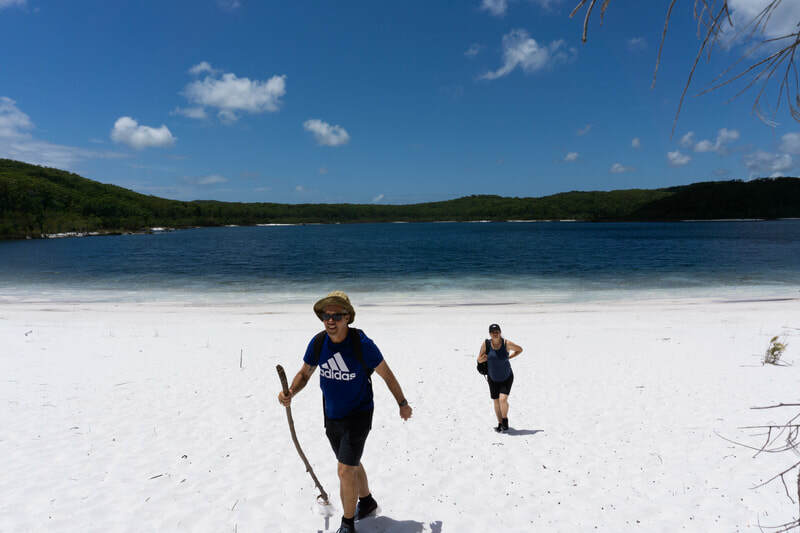 * Fraser Island Hiking has the permit to run this hike even when the tracks are closed, this hike will run all year, except for during the hottest months of summer (December and January). Arrive at our head office in the afternoon, for a short hiker briefing. The guide will then transfer the group on the afternoon barge across to the accommodation on Fraser Island. Relax and enjoy a gourmet cheese and wine platter, before getting a good nights sleep before starting the hike! Wake up and enjoy a energizing healthy breakfast, before heading off on your first day of walking. Your guide will drop you at a meeting point along the track where you will walk along the rainforest trails into Lake McKenzie. When you arrive you can enjoy your healthy pre-packed lunch at the picnic area and enjoy a refreshing swim. ​Along the way you will stop off at the pristine Basin Lake where you can take a stop and have a refreshing swim. Marvel at huge Satinay trees growing out of the pure sand in this rainforest wonderland. When you arrive back at Central Station your guide will be waiting for you ready to transfer you back to the accommodation for your cheese platter overlooking the magic sunset, followed by your yummy gourmet dinner! Wake up in your accommodation in the great rainforest, after a hearty breakfast you will walk exploring the untouched, lush and tropical rainforest, as you traverse through some of the oldest trees at Pile Valley! You will transverse through the old tramline track as you meet the guide at the meeting point along the track for your next destination. The guide will then drop you up to the Lake Wabby lookout point, where you can enjoy your energizing lunch while overlooking some stunning views! ​After this you can then walk down to Lake Wabby, where you can relax in the deepest Lake on Fraser Island! Once finished, you will then do a short walk out to the Eastern Beach where you guide will be waiting to transfer you back to Kingfisher Bay Resort, where you can relax and have a nice sunset drink before boarding the barge back to Hervey Bay! See the best lakes of Fraser in luxury style! Experience five of Fraser Island’s most beautiful pristine freshwater lakes on this, 3 day and 2 night, fully supported and accommodated hike! Every day you will be transferred from your accommodation in comfort by one of the Fraser Dingo 4WDs, to a different point along the Great Walk track. Once you head off on your walk you’ll experience bliss in the wilderness, walk through spectacular towering rainforests and swim in freshwater lakes with sandy beaches. Sites: Central Station, Pile Valley, Baisn Lake, Lake McKenzie, Lake Wabby, Lake Boomanjin, Lake Benaroon, Lake Birrabeen. Start your adventure with a Fraser Dingo 4WD transfer over to your accommodation, where you will be able to leave your overnight bags with clothing etc. To start the journey the guide will drop you at Lake Boomanjin, where you will be able to have a nice lunch and refreshing swim. After lunch you will start the hike to Lake Benaroon, walk through lush tropical rainforest and enjoy the outdoors. When you arrive at Lake Benaroon have another nice refreshing swim, and then hike out to M2 and Lake Birrabeen to meet the guide, before heading back to the accommodation for sunset snacks and wine. Relax and have a nice hot shower while the guide cooks you up a yummy dinner! Wake up on a comfy bed to the peaceful serenity of the bush, enjoy a light breakfast before embarking on the second day of hiking. The guide will drop you at a meeting point on the track, M3, as you walk through amazingly scenic rainforest transcending into Central Station. When you arrive at Central Station, you will be able to walk around the Central area and explore the boardwalk and information. When you return back to Central the guide will cook you up a hot lunch, where you can enjoy before the second half of the day. After lunch you will then hike to Lake McKenzie, via Basin Lake. Once you've reached Lake McKenzie you can enjoy a peaceful afternoon swim and enjoy golden sunset hour where you can enjoy afternoon nibbles of wine and a cheese. Once finished, do a short walk out to M6 to be picked up by the guide! Wake up early, enjoy a hearty breakfast and pack up before starting the last day of hiking. The guide will drop you at Central Station to do the Pile Valley walk, before continuing through the Old Tramline trail to the M7 meeting point (note: if you want to skip Pile Valley, you can be dropped at the closer, M5, meeting point instead). Here you will meet the guide and be transferred to the Lake Wabby lookout point. When arriving you can enjoy a pre-packed lunch and magnificent scenic views over the Lake and the sandblow at the Lake Wabby Lookout. Do the short walk down into Lake Wabby and enjoy a relaxing swim, in the deepest lake on the Island! After this, you will do a short walk up the sandblow and through the rainforest to the Eastern Beach where your 4WD awaits. The 4WD will take you back to the Kingfisher Barge landing where you will be able to enjoy an afternoon drink at the Jetty Hut before boarding the barge to return to Hervey Bay! See the best sites of the Fraser Island Great Walk! 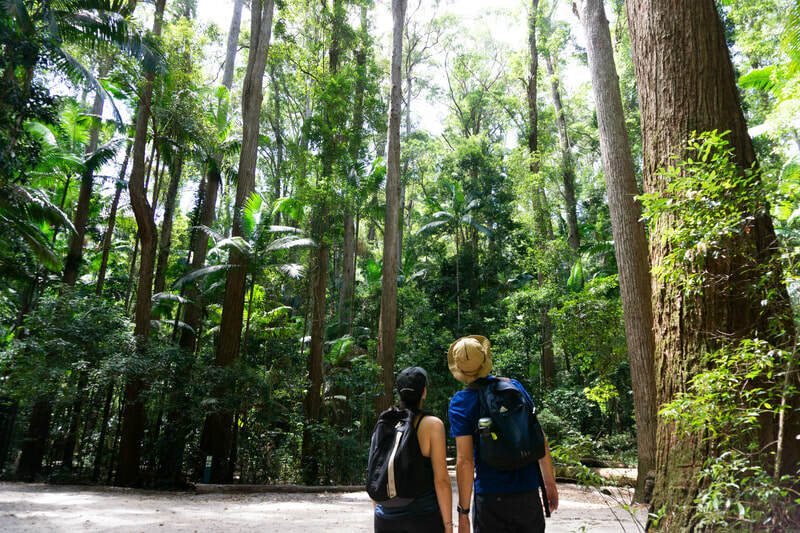 Walk the best of the Fraser Island Great Walk trail, as you transcend through the lush tropical rainforest of World Heritage Fraser Island. 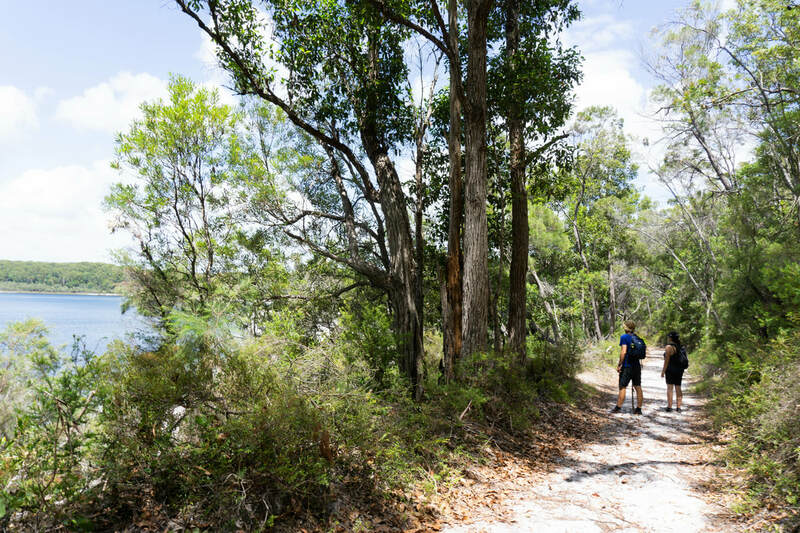 This walking options lets you see the must do sights on Fraser Island with a touch of luxury, so that you don’t have to worry about camping or carrying your own pack! This 3 night and 3 day hike covers major points along the Great Walk including the Valley of the Giants, Lake Boomanjin, Lake Birrabeen, Lake McKenzie, sandblows, Central Station and the Pile Valley. Sites: Lake Garawongera, Valley of the Giants, Central Station, Basin Lake, Lake McKenzie, Pile Valley, Lake Birrabeen, Lake Benarron, Lake Boomanjin. Wake up early and enjoy a hearty breakfast before your private 4WD transfer takes you up to the most northern part of the Great Walk, Lake Garawongera and surrounding areas. 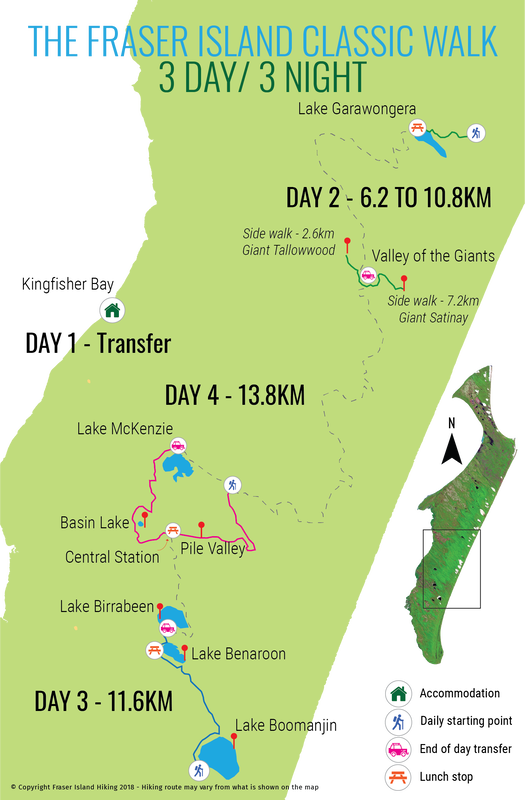 You will be dropped at a meeting point along the track and do a short walk into Lake Garawongera. Here you can enjoy a nice refreshing swim in the tea-tree infused lake and enjoy a nice lunch! After lunch you will be driven into the Valley of the Giants, where you can undertake one of two side walks to see some of the oldest and largest trees on the island! The Giant Tallowwood (2.6km return) or the Giant Satinay (7.2km return). Once you have finished your afternoon walks, the guide will drive you back to the accommodation for dinner! Wake up to the serenity of the Great Sandy Strait bush sounds, before embarking on your next day of exciting hiking. After breakfast your guide will transfer you to the Lake Wabby lookout where you will hike via Lake Wabby to the eastern beach of Fraser Island. Then travel by 4wd down to Lake Boomanjin, where you can have a quick swim, before starting the walk. You will then walk through ever changing landscapes of sand and rainforests before arriving at Lake Benaroon. Here you will be able to stop for a nice swim and your packed lunch! After lunch you will then have a short afternoon hike through the forest and be picked up and dropped in to Lake Birrabeen. Where you can relax in the afternoon with a refreshing swim. Return back to the accommodation for some wine and cheese overlooking the Great Sandy Straits from the deck. Relax and enjoy a gourmet diner. Wake up nice and early and enjoy a yummy breakfast before heading off on the last day of hiking. Your 4WD transfer will drop you at another meeting point along the Great Walk track where you will walk through mesmerizing rainforest into the Pile Valley. After this you will continue your walk into Central Station, where you will have a well-deserved cooked lunch! After lunch you will embark on your walk into Lake McKenzie. Along the way you will be able to stop off at Basin Lake and have a refreshing swim, before heading into Lake McKenzie. Finish you last day of hiking at one of Fraser Island's most popular destinations, while you immerse yourself in the silica white sand and crystal clear blue water. Your 4WD will then transfer you back to off the island, through Kingfisher Bay where you can enjoy a relaxing drink as the sun sets! Accommodation will be in a bush, eco house on Fraser Island. The house will have proper facilities and amenities, including; hot water, toilet facilities, proper beds, catered chef, a place to relax. Hikers will be transferred back to the house after their daily hike. Gourmet meals and platters, including: luxury cooked dinners, continental breakfasts, healthy lunches, energizing snacks and nibbles, water , drinks including wine and beer, accommodation (luxury available) - including hot showers, proper toilets, beds, barge and 4WD transfers everyday on the island, guide while you are hiking (optional), additional hiker information & safety briefing, maps and itineraries. Personal belongings, small day pack to carry necessities (lunch/ water etc.) whilst hiking, proper hiking shoes, swimmers, hat, sunglasses, sunscreen, camera, phone, hiking shoes, insect spray large water bottle (facilities to fill up). Hike departs from the Fraser Dingo 4WD Adventures office in Urangan, Hervey Bay for your 4WD transfer to the Island (If you have pre arranged, it is possible to get a pick up from your hotel/ hostel in Hervey Bay *may cost extra). ​The 4WD transfer goes from the Fraser Dingo 4WD Adventures office to the River Heads Barge and then onto Fraser Island to your hiking destination.